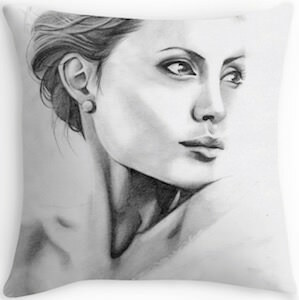 This Angelina Jolie portrait pillow is something every true fan of Angelina wants on their couch or bed. The pillow shows a black and white portrait of the famous movie star while she looks away. On both sides of the Angelina Jolie pillow you can find the same image and the pillow is available in 3 sizes and even as pillow cover only if you decide that you have the perfect pillow for it. Made from spun polyester the pillow is strong and great looking and it really would be a great pillow to have for you home so that you can enjoy it for years to come.